Idea: Bar/Line View - background guidelines Mean+/- 'n' STDs? Please find the attached Excel chart format in which the plot area has been formatted with calculated gradient effects. Can we have this available in Omniscope for one of our important report requirement? Rajesh - We have re-classified this as an Idea. We will analyse the requirments, and welcome other comments/suggestions on this thread. 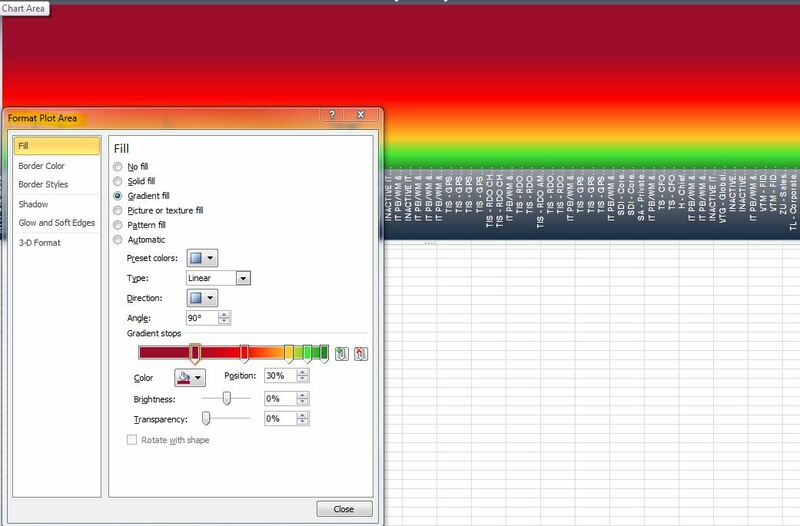 In the example below I used 'pick' option on the colour palette to 'lift the colours' from your chart, picking the exact shade of red, yellow and green (place the marker over the colour and hit Enter or Space). We currently have 3 colour grading points, but are considering adding more. Thanks for your feedback Paola and Thomas. @ Paola, Can this be integrated with the configuring color gradient and use under the attached COLOR GRADING IN BAR CHART snapshot as attached? Note: I have multiple measure which has different value but there should be common coloring scheme for all calculation on a bar chart. 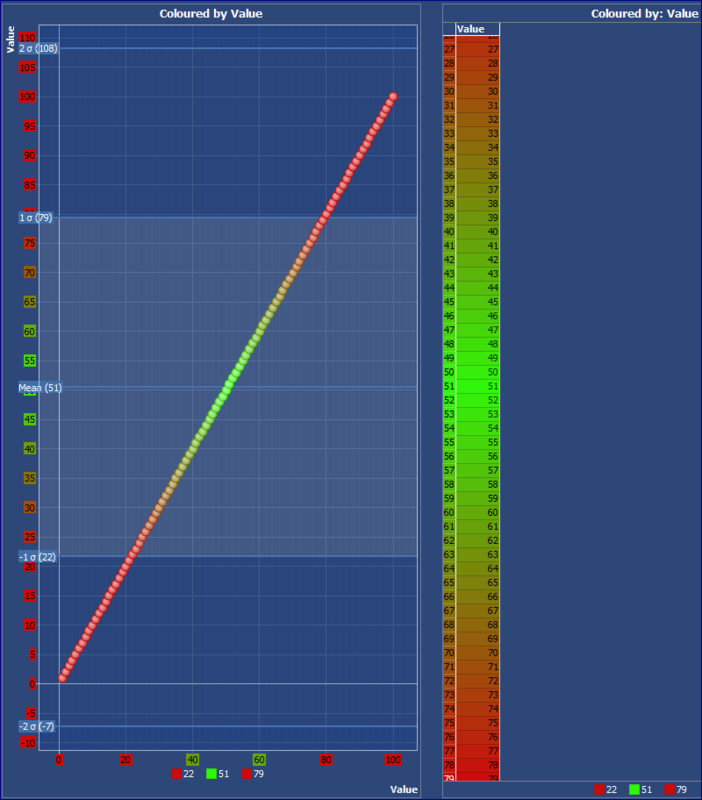 The plot area can be affected using the stats on the graph view where you can define regions by colour, is it possible to actually put the gradient colouring into that interface? Perhaps expand those options for the Bar/line too? 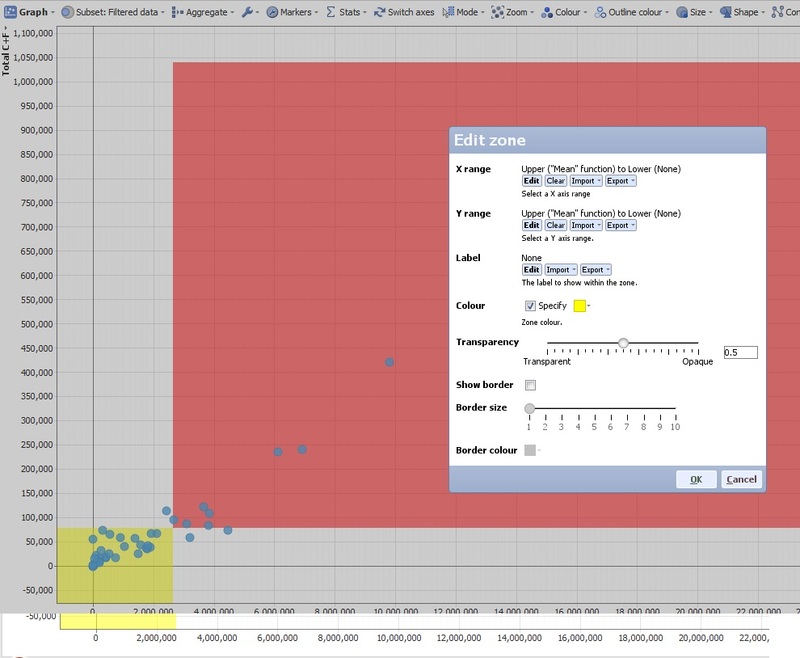 Zones in the Graph view probably come closest to your request, as Daniel suggested, and you can have either custom zones on X / Y axes or both, using the mean, max, min, standard deviations and other functions to define the range, or decide on custom values. Each zone's colour can be customised, labelling and borders too. Please see image below. Hi Paola, This is really critical to get added to the bar/line functionality for our user base. I think this thread may confuse people on what's really needed. How can we send out to get a better voting poll? Brian - The purpose of these Ideas threads on the Forum is to refine and optimise feature requests, as well as gauge interest. Why not post the requirement as you see it, ideally with a sample IOK data set illustrating the type of story you are trying to convey? 3.) 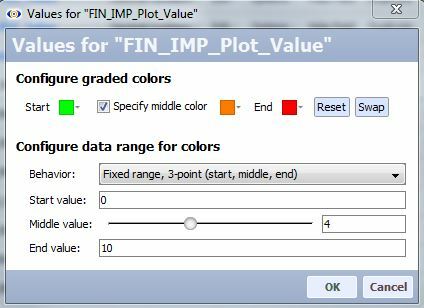 adding a continuous value colouring option with user-definable breakpoints not only at mean (existing) but also at +/- 1 and 2 sigma. 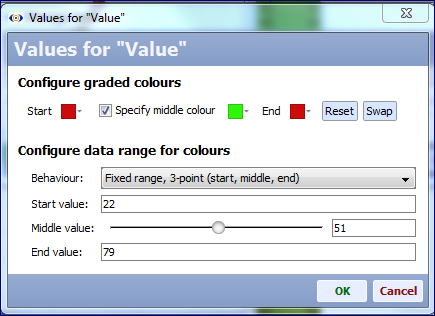 Currently there are many options for controlling start value/colour, end value/colour, choice of 2 or 3 inflection points, middle colours and even adjustments for skewed mean distributions. 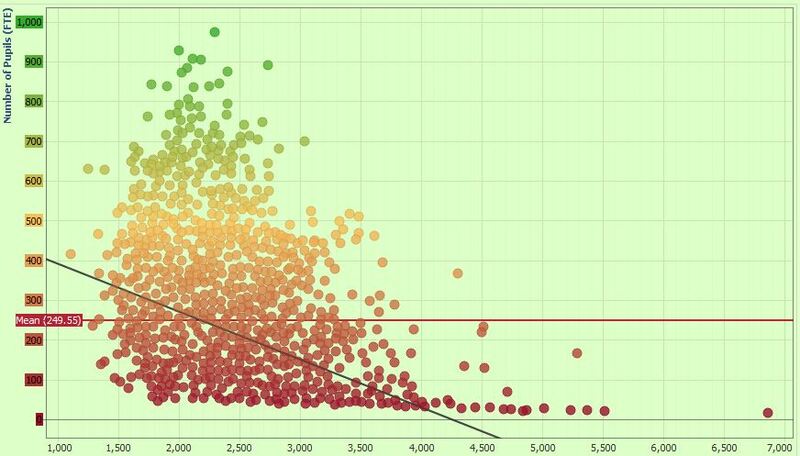 Is the idea to add an option to define a 6 inflection point option with start, -2, -1, mean, +1, +2 sigma and end as breakpoints for changing graded colouring? But this is not really gradient colouring, since it seems like you want to assign the same fixed colours to ranges and points beyond internal limit values, i.e. 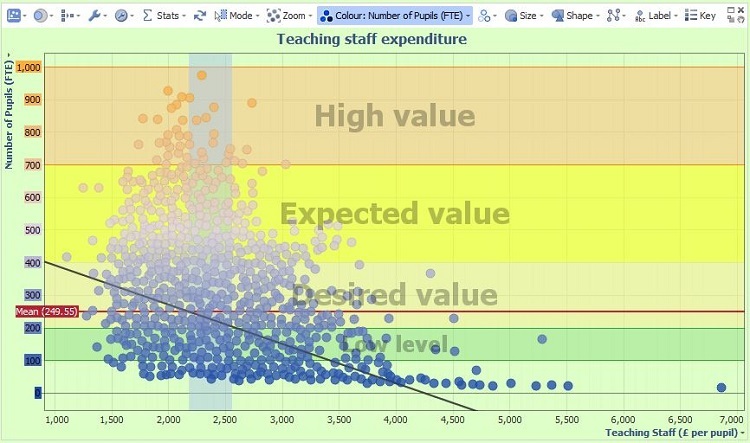 values above & below +/- 2 sigma might be same colour? 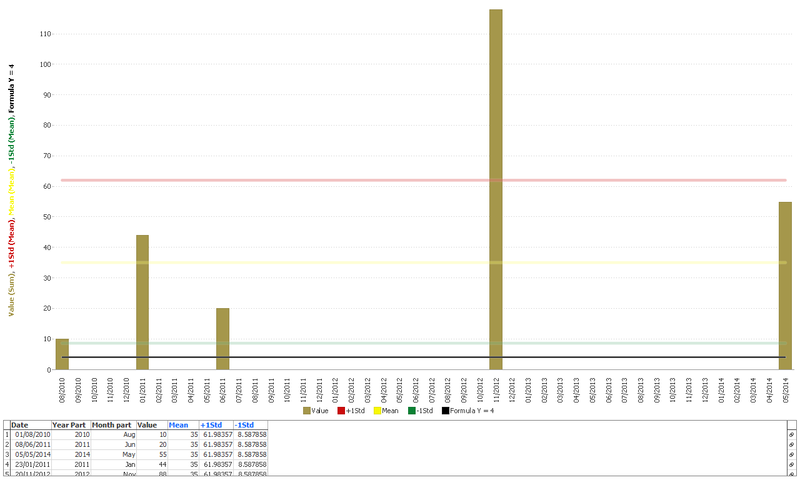 Thanks for the updates, but zone colouring works only for Graph View chart and not for Bar/Line View charts. We have this requirement based on Bar/Lines charts. 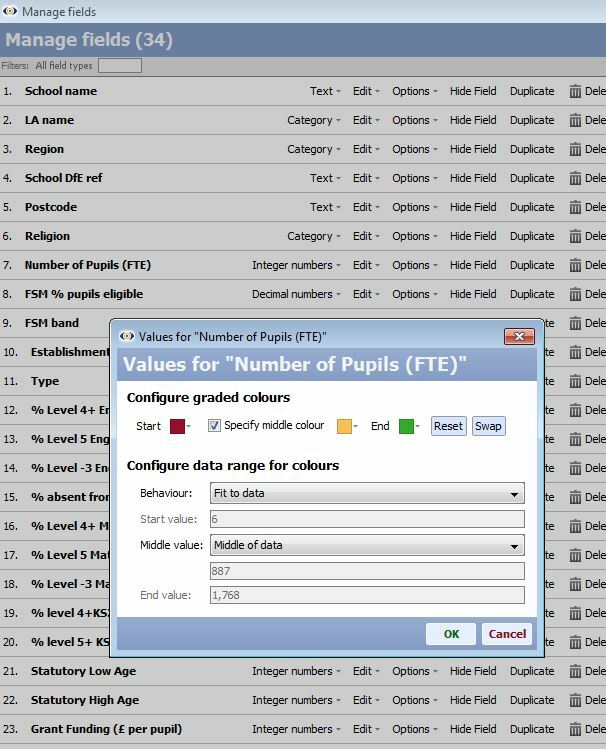 Not sure if this would help as a workaround, but you could add formula fields to create Mean and +/-STD values, then add them as measures to the Bar/line view, creating the zones, similar to Graph view. It will not colour the plot area, but will work as border for other bars/lines, and you will be able to chose the line thickness and colour. Please have a look at current file attached. In this file if I add column formula in measures with a value 4( As I need a straight line at 4). The line is getting combined with -1std line. Cannot we make this independent?? 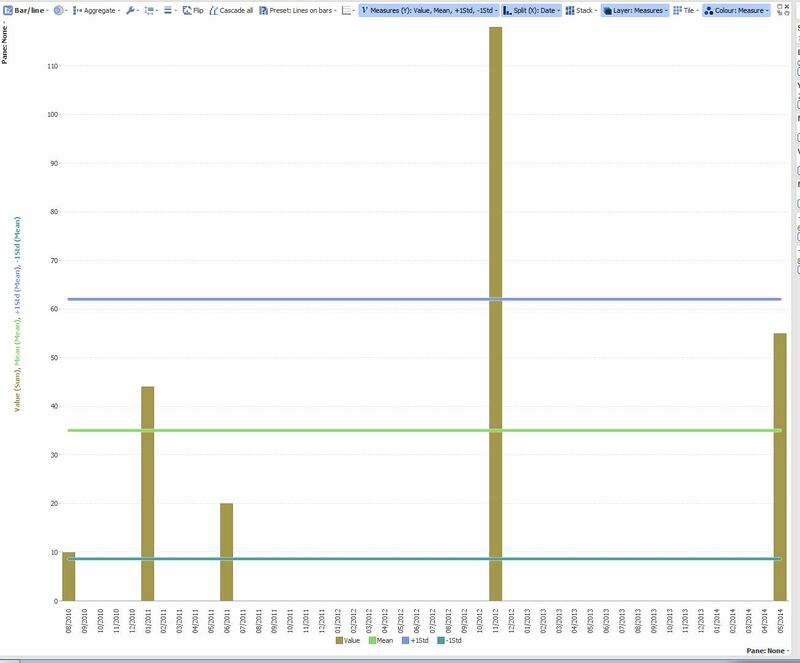 For my actual report the graph is very complecated and things are completely messed if I use "Bars On Line" Layout. 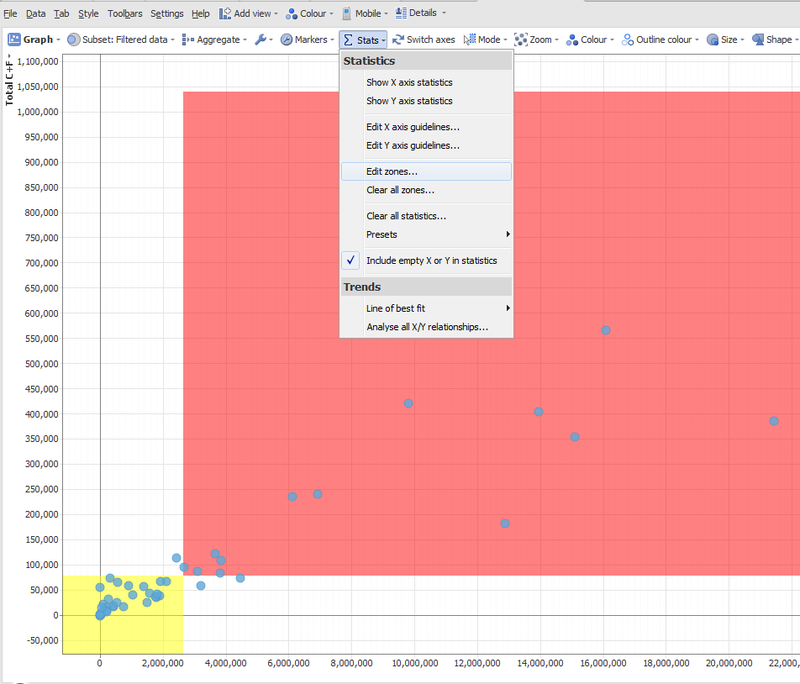 Jagran - Remember that you can have many views on a tab, and unlimited tabs and (unrelated) datasets in an IOK file. The purpose of interactive visual reporting is to guide the consumers of the report, dashboard or decision support tool through a 'story' that gives them confidence in their decision-making. It is tempting to pack a lot into one interactive view on one tab trying to create a single 'tool' view that can answer all questions. This is not, however, easy for consumers to digest. In general it is better to use defined Subsets and Named Queries, Tab and View footers, Tab links and Content View and Helpfile text to 'spread out' the story across multiple tabs and views, some tabs sharing the same filter and Variable settings, so that the consumer is 'guided' through the story.